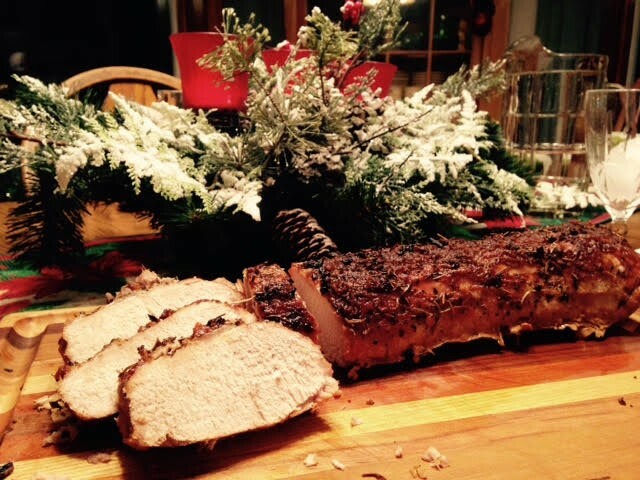 Place the pork tenderloin on a rack in a roasting pan. Combine the remaining ingredients in a small bowl. With your fingers, massage the mixture onto the pork loin, covering all of the meat and fat. Roast the pork for 30 minutes, then reduce the heat to 425 degrees F and roast for an additional hour. when the internal temperature reaches 155 degrees F, remove the roast from the oven. Allow it to sit for about 20 minutes before carving. It will continue to cook while it rests.